It’s fall and there are blessings all around us, especially in the pumpkin patch! Children will love the sweet rhyming text by Kim Washburn and the whimsical illustrations by Jacqueline East as they take in the fun of the fall season and remember how much they have to be grateful for. 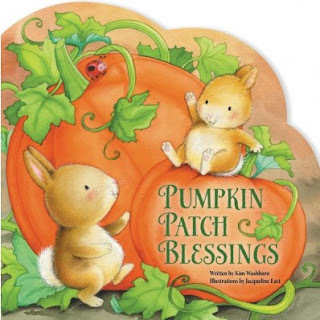 Pumpkin Patch Blessings by Kim Washburn is a very cute board book for young children. It is die cut with a colorful cover featuring bunny rabbits playing on pumpkins. The story is told in rhyme, and would make such a good read aloud for young children at home or in a classroom. Readers of Pumpkin Patch Blessings will find much to be thankful for in fall including sweater weather, colorful leaves, roasting corn, a hay ride, and of course pumpkins! and then start to fall. and kick through them all." The illustrations by Jacqueline East are colorful and appealing. They show young children enjoying all the aspects of autumn. The book is sturdy and well made, with board book pages -- great to read again and again. I recommend it for a home or preschool library. It is perfect for a fun fall read! I received a copy of this book from BookLook Bloggers in exchange for an honest review.